If you do not have field data or existing strike and dip measurements, but you have a grid file of the surface, you can calculate the strike and dip information from the grid file in Surfer and then display it on your map. Click Grids | Edit | Convert. In the Open Grid dialog, select the grid and click Open. In the Save Grid As dialog, change the Save as type to DAT XYZ (*.dat) file and click Save. This gives you a data file of the X, Y and Z values of all the grid nodes. Click Grids | Calculate | Calculus. Select your grid-based map from the Input Grid dropdown list or click the Browse button to navigate to and select the grid file. In the pane on the left, select Terrain Modeling | Terrain Slope. This will be the dip amount. Click the Change Filename button ( ) to the right of Output Grid File. In the Save Grid As dialog, enter a name, change the Save as type to be DAT XYZ (*.dat), and click Save. Click OK. This will give you a data file of the X, Y and dip amount. Click Grids | Calculate | Calculus again. Select your grid-based map from the Input Grid dropdown list or click the Browse button to navigate to and select the original grid file. In the pane on the left, select Terrain Modeling | Terrain Aspect. This will be the dip direction (90° from strike direction). Click OK. This will give you a data file of the X, Y and dip direction. Now you have three DAT files: the original grid, the Terrain Slope grid, and the Terrain Aspect grid. Click File | Open, select the original grid DAT file and click Open. It opens in the Surfer worksheet. Click in cell D1 and click Data | Edit | Merge. Select the terrain slope DAT file and click Open. Columns D and E will be the same as A and B, so select columns D and E and click Data | Edit | Delete. Select cell E1 and click Data | Edit | Merge. Select the terrain aspect DAT file and click Open. Columns E and F will be the same as A and B, so select columns E and F and click Data | Edit | Delete. Click Data | Data | Sort. Choose Column D from the Sort first by dropdown list and click OK. Select all rows with the blanking value in Columns D and E and click Data | Edit | Delete. Enter the Transform Equation: F=E+270. Enter the Transform Equation: F=IF (F>360, F-360,F). Click OK. This tells Surfer that if the data in column F is greater than 360, to subtract 360 from the value. Otherwise, leave it alone. You may want to select row 1 and click Data | Edit | Insert to insert a row at the top and enter in a data header to tell you what the columns are (i.e. X, Y, Z, Dip, Dip Direction, Strike). Click File | Save or File | Save As to save the data. You now have X, Y, Z, dip amount, dip direction, and strike azimuth. The calculated strike azimuth conforms to the American “right hand rule”, which is to always report the strike azimuth so that the dip direction is on the right side of the strike line (if you make an “L” shape with your right hand, palm down, then your index finger points down dip and your thumb points to the strike azimuth). 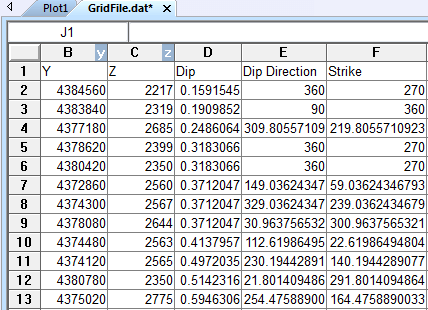 To display the strike and dip information on a map, please see the article: How can I display strike/dip data on my map?